February 21, 2019 - Remodel Werks, a Massachusetts builder and client of Born Imagery, took home the Gold Award for Best In American Living award at the 2019 International Builders Show this week in Las Vegas. This was a national level award from the NAHB and was the second high level award for this kitchen project in Shrewsbury, MA. We were proud to be involved with this prestigious award by providing a visual representation of the project through good photography. Thanks to Joe and his team for including us and we’d like to offer our sincerest congratulations. 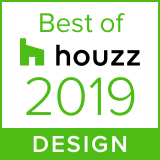 January 24, 2019 – Born Imagery of Merrimac, MA has won “Best Of Design Photography” on Houzz®, the leading platform for home renovation and design. The architectural photography firm was chosen by the more than 40 million monthly unique users that comprise the Houzz community from among more than 2.1 million active home building, remodeling and design industry professionals. The Best Of Houzz badge is awarded annually, in three categories: Design, Customer Service and Photography. Design awards honor professionals whose work was the most popular among the Houzz community. Customer Service honors are based on several factors, including a pro's overall rating on Houzz and client reviews submitted in 2018. Architecture and interior design photographers whose images were most popular are recognized with the Photography award.